The last post was an article related to Moon and it’s journey through Aries. 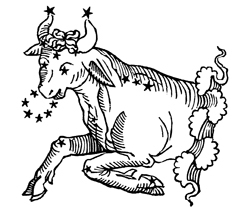 Picking up from that article it seemed proper to move on to the sign of Taurus. (Today’s Moon Location) In Taurus, the Moon which represents security, indicates a need for financial security. Recalling that the Moon is the emotional side of our nature, it is also our security and what makes a person feel secure. Taurus is the sign that rules the second house of a Wheel or Chart. This is the house of financial worth or value. It is also about the worth or value of the individual in general. Indicates the ethical and moral value of the individual as well. In the sign of Taurus the Moon is more concerned with being secure and having security. This might be stronger in the individual with the Taurus Moon even more then the Taurus Sun, due to the fact that the Sun is not an emotional energy, it is driven by different motives. It does however indicate generally that the individual is very steady with their emotions. There is a good ability to keep their emotional nature on an even keel. The Moon is also the symbol for the Mother. A Taurus Moon also reflects the energy of the individuals mother. A Taurus mother or Moon could represent the fact that the individual felt that mother was over-bearing at times. Even if this was only their perception. It would be difficult for the parent or mother in particular to “cut the cord.” Or again this is how they are seen! Remembering that in a family there are several children who all have different Moons, yet all share the same mother. With all this said there could be a closeness to Mother. In Taurus the Moon is very stable. This will be true whether emotionally or just the idea of living in the same area most if not all of one’s life. There is a stability in those connections. In general the Taurus Moon is very good with money matters. That need to reach a point of financial security leads the Taurus Moon to learn how to handle money. They can be frugal, though they do LOVE the finer things in life. There is much common sense overall with Moon in Taurus. While the Moon is transiting through Taurus, might be a good time for all of us to pay more attention to our spending. If we do shop, it might be a great time to look for a deal. Paying attention to things closer to home and the domestic front might draw our attention. It might be a time when we find ourselves reflecting on things such as our worth or value, how much spending we are doing, if we feel appreciated for our efforts in life whether with in our relationships with our loved ones or those we labor for?